Register with the Car Boot Email Update Service to receive updates on when car boots are taking place. Register here. The 2017 Looe Lions Car Boots will start on June 25th, and take place every Sunday morning thereafter (subject to weather conditions) throughout the summer months (June to September) in two fields at West Wayland next to the camping and caravaning holiday camp. The official open hours are 08:00 to 12:00 although many regular sellers arrive from 06:30. The location is rural with extensive sea views adding to the enjoyment of the occasion. Sellers are charged a pitch fee of £5 (however large pitches may be charged more at the discretion of the Lions Committee).There is no requirement to book a pitch, just turn up. No traders. There is no entry fee or car parking fee for buyers except on the day of the Looe Lions Carnival Rally when there is a charge of £2 per car which also allows the occupants access to the rally and its many attractions. Whilst there is no entry fee for buyers please buy a Duck Race ticket or two from us at the entrance (you might win £1,000 if you do) or just put a donation in the bucket. We have a refreshment van selling bacon butties etc and hot & cold drinks etc. and an ice cream van providing something cooler. There is a toilet block in the adjacent caravan park. You can call the recorded information line on 07530 690717 for up to date information and whether the sale has been cancelled due to the weather (Please note that this is an information only line and messages will not be listened to). The message will be issued on the Saturday evening and updated at 07:00 on the day of the car boot when we know the actual weather and the state of the field, but generally if it is dry there will be a car boot sale. 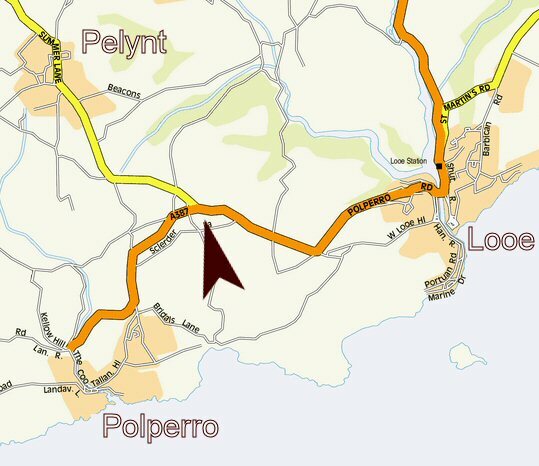 The Car Boot Sale is located in the two fields to the south of the junction of the B3359 Pelynt Road and the A387 between Looe and Polperro, shown by the arrow on the map above. The entrance to the site is gained via the gate at the western end of the fields at the junction of the A387 and Sclerder Lane. Please indicate to the Lion at the gate whether you are buying or selling, you will then be directed to the appropriate place to park.